Placing a sportsbet is a game. Placing a sportsbet is a game of skill. The challenge is to gather and analyze as much information as you can about a game, weigh the probabilities of each team winning, and subsequently compare your opinion to the oddsmaker's. While luck may be a deciding factor in the outcome of any single game, and will inevitably go against the bettor on occasion, it will balance out in the long run. Being a consistent winner in sports betting is not about luck but whether the bettor is prepared to invest the time and effort to become knowledgeable about the sports he bets on, whether he can weigh all the factors in a cool, objective fashion, and whether he adopts a consistent, disciplined, long-term approach to betting. The bookmaker is simply a middle-man who operates on a small profit margin and, ideally likes to see half the money wagered on one team and half on the other, assuring a profit. If too much of the money goes on one team, the bookmaker will move the line or point spread to encourage bets on the other team in an effort to balance his book. The person the bettor is attempting to beat is the oddsmaker, and the oddsmaker's views on each team's chances. Just by flipping a coin, bettors will be right 50% of the time. At odds of 10/11, only 52.4% of the bettor's bets have to win for him to overcome the bookmaker's profit and break even, so he only needs a very small edge to become a winner. So bettors must do their homework and bet selectively. 55% winning bets is definitely achievable and 60-65% is a realistic target. At those levels, the sports bettor will have an extremely profitable and enjoyable hobby. 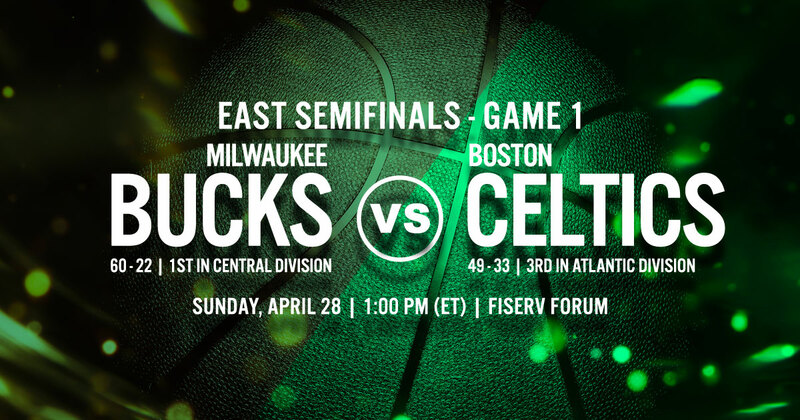 On Sunday, the Milwaukee Bucks will host Game 1 of the Eastern Conference Semifinals against the Boston Celtics. The best-of-seven series is set to start at 1PM ET. Game 1 will be hosted by Milwaukee at the Fiserv Forum in Wisconsin. Milwaukee and Boston both advanced into the Eastern Conference semifinals by sweeping their first round opponents with ease. Bucks Giannis Antetokounmpo and rest of his teammates will face a stiffer challenge against Boston. Boston has struggled to find consistency during the regular season but they were sensational in 1st round of the playoffs. They will be tested anew once they visit the NBA-best record holder Milwaukee Bucks. Milwaukee's Giannis Antetokounmpo will be tasked again to lead his team as they face the Boston. He has done it during the regular season which made him one of the frontrunners for the MVP award. He's an offensive nightmare against any team in the NBA and he has a high basketball IQ. Boston's Kyrie Irving will continue is inspiring and sensational play while his good buddy Marcus Smart is out with an oblique injury. The Celtics are touted as one of the top teams in the Eastern Conference but they should play smart against Milwaukee in their best-of-seven semifinal series. The sportsbook handicappers have installed the Milwaukee Bucks as an 8.5-point favorite to beat the Boston Celtics in Game 1 of the Eastern Conference Semifinals on Sunday noon. Watch Damian Lillard score 50 points (including the unbelievable 37-foot 3-point game winner) as the Portland Trail Blazers eliminate the Oklahoma City Thunder, 118-115, at the Moda Center on Tuesday. Credits to the video owner.